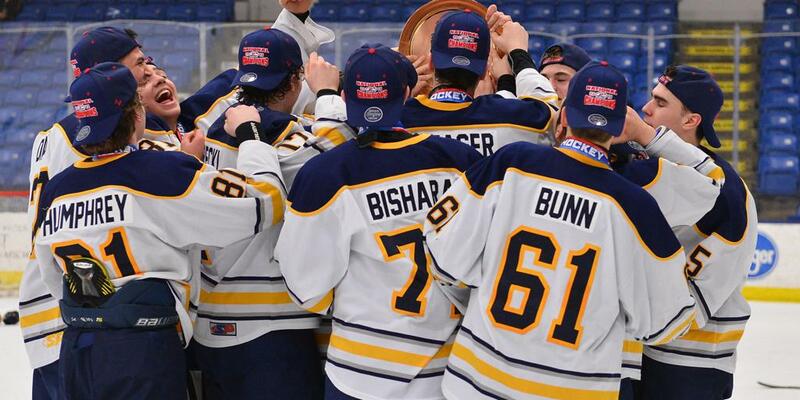 STRONGSVILLE, Ohio - Team Texas earned the first title of the 2019 Chipotle-USA Hockey High School National Championships. Texas skated to a 10-0 victory over Minnesota Dynamo Black to capture the girls high school crown. Texas scored early, and often, in the first period in route to its convincing performance in the championship game. It was revenge of sorts for Texas after losing to Minnesota in pool play on Saturday. Sydney Rarick, Riena Jahnke and Lily Martinson all found the back of the Dynamo net within the opening 5:10 of the first period, while Naya Penn earned three assists. Taking advantage of a power-play opportunity late in the first period, Rarick netted her second goal in the opening 12 minutes of play. Rarick and Riena Jahnke would earn hat tricks before their mornings were complete. By the end of the opening period, Texas found itself with a 4-0 lead. The scoring continued into the second period. Riena Jahnke scored a pair of goals, each after assists from her sister Mika Jahnke. Sandwiched between Jahnke’s two goals was an impressive slap shot placed in the top right corner of the Minnesota net by Erika Shirer. With Texas already holding a commanding 7-0 lead heading into the third, Rarick, Audrey Shirer and Charlie Foxhoven completed their team’s scoring and gave Texas a 10-0 win. Riena Jahnke led the way with four points in the win (3 G, 1A). Mika Jahnke (3A), Martinson (1G,2A), Penn (3A) and Rarick (3G) each earned three points before hoisting the championship gold plate. Texas made its way into the final in dominant fashion. The team defeated the Gilmour Gladiators 16-0 and Missoula Lady Bruins 9-1 in pool play. Then, Texas lost to the Dynamo 3-2 in their final game of pool play but followed it up by defeating the Monarch Coyotes in semifinal action. Team Texas goaltender Kendall Parker stopped all 21 shots she faced in the championship game and earned a pair of shutout performances throughout the tournament. Along with strong goaltending play, Texas outscored opponents 45-4 during the tournament. It started with the Jahnke sisters and continued on as a team effort. The Dynamo earned the top seed after pool play, winning games against Anchorage, Monarch Coyotes and Team Texas. Minnesota then defeated Anchorage 6-2 in its semifinal game. Despite a hard finish to the tournament, the team is still proud of what it accomplished in Ohio. In 2018, Minnesota Premier Prep Green took home the first girls high school national championship in its home state. Team Texas becomes the second team to win the girls title. The tournament was once again another success. “The national tournament is something you can’t put into words,” Miller said. The girls will remember this for their life time. Story from Red Line Editorial, Inc.
©2019 Youth Nationals / SportsEngine. All Rights Reserved.